January 2017 – Concurrent Technologies, a leading supplier of boards for critical embedded applications, announces support for the latest generation of Intel®Xeon® processor E3-1500 v6. 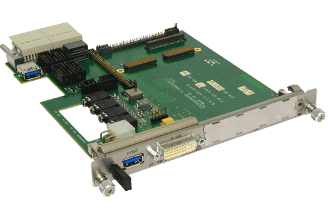 The first product from Concurrent Technologies based on this new device will be a new AdvancedMC® (AMC) module, AM G6x/msd, which is suitable for high-speed physics experiments, instrumentation and test based applications. 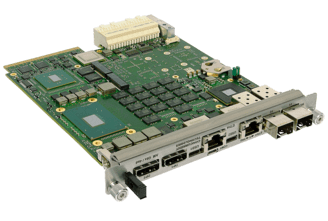 AM G6x/msd customers will be able to specify a choice of processors including the Intel® Xeon® processor E3-1505M v6 or Intel® Xeon® processor E3-1505L v6. These are both high performance 4-core devices with Intel® HD Graphics P630 and are optimized to create board variants with high compute performance or low power consumption respectively. AM G6x/msd has an on board 64GB Solid State Drive (SSD) for reliable Operating System and application storage. For high speed mass storage, AM G6x/msd has two sites for M.2 storage modules based on PCI Express® M-key interconnects supporting the new Non-Volatile Memory Express® (NVMe™) protocol which is optimized for solid state drive storage performance. AM G6x/msd is also the first board from Concurrent Technologies that has support for the future Intel® Optane™ range of 3D XPoint™ modules. These are expected to be made available during 2017 and offer the promise of further improvements in storage speed. Compared to Concurrent Technologies previous AMC products, AM G6x/msd offers improved CPU and memory performance. A version will also be available offering dual 10 Gigabit Ethernet connectivity for higher speed networking with the ability to connect via either electrical or fibre links making it more suitable for use in remote locations. As with all other Concurrent Technologies products, AM G6x/msd is designed for long life-cycle applications. Concurrent Technologies has a wide product range including VME, VPX™, CompactPCI®, XMC and AdvancedMC® processor boards and further products supporting Kaby Lake will be announced during 2017.